When it comes to having a head of hair that could rival even Rapunzel, one of the most annoying things to endure is that it constantly gets tangled (and if there isn’t a handsome fella like Flynn nearby, then it just isn’t worth it). Sometimes the I-woke-up-like-this hair is a look, but if you're aiming for a smooth, shiny, and tangle-free head of hair, then we've got all the knotty details. Skip the painful hair detangling process and learn how to get the hair of your dreams. No matter how much you care for your tresses, sometimes knotty hair becomes inevitable. You're more likely to deal with constant knots if you belong to one or more of the following hair textures: you have long and curly hair, you skip conditioner, your hair is dry and damaged, you sleep with your hair down, and you skip brushing it throughout the day. If this is you, read along for these tips to avoid knotty hair. Brush your hair before bathing: The key to avoiding knotted hair is to brush it before you shower. This is because adding water only makes the hair more knotted. This can be painful to brush out and can even lead to breakage of the strands and split ends as the hair is weakened. If your hair is more tangled after a shower, there is no safe way to detangle it without at least a little risk of breakage, according to Michael Boychuck, a celebrity colorist and owner of COLOR salon in Las Vegas. Incorporate conditioner in your shower routine: Conditioner is key to adding moisture to your hair. It is vital if you want to avoid those painful tangles. For added attention, try hair masks once per week or use a leave-in conditioner, paying careful attention to the ends of the hair. Sleep with your hair up: We know that when we sleep, we toss and turn so much. So, yeah, that's a lot of friction to our hair and the pillow. You can do the pineapple trick, which is where you flip your head upside down, bunch the hair up in a pineapple shape, and then clip it all together using alligator clips. Or, tie your hair up loosely in a bun, securing it with a scrunchie. If all else fails, try a silk pillowcase, as it provides less friction to the hair. Invest in overall hair care: Keeping things as natural as possible will help reduce the tangles. Limit your use of hot hair tools such as straighteners and curlers, get your hair trimmed every three to six weeks, and skip hair products that contain lots of chemicals. For example, avoid those with high amounts of alcohol, as too much can dry out your hair and make it prone to breakage. Instead, opt for natural products, especially those that are sulfate free. $15, Tangle Teezer, The Original Detangling Brush: An Allure Best Beauty Award winner, this detangling brush can be used on wet or dry hair. 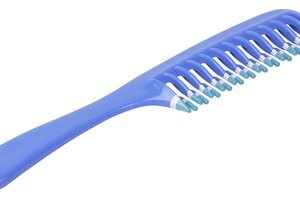 It has a patented teeth formation that bends and flexes to painlessly remove knots no matter the hair type. $27, Bumble And Bumble Tonic Primer: What doesn't this hair care line have? Their products provide us health and shine and now a detangler. It's rich in nutrients, tames tangles, and nourishes your scalp. It can be used by both males and females. With all these tips in mind, go forth to have smooth, healthy, and tangle-free hair. Now who needs a Disney prince when you have great hair?